Constantly * Changing: I hope my smile can distract you. I hope my smile can distract you. had a surprise friend who came over to stay for the night. it was a really big surprise that she'd ask it of me because i only knew her from another friend and wasn't so close to her, but i agreed nonetheless because she really needed it. went around sunway today with my friends and we hung out for a while. in the mornings it was me, lala bear, wan xin and gwen, but gwen and zin had to leave earlier so it was just me and lala bear in the midst of the afternoon buzz. lala bear didn't have enough sleep last night so she was feeling a bit "out-of-place" and very hyper about things. LoL it was kindda interesting to see her bouncing around and giggling, but i like it when she's feeling happy. it makes me smile. we discussed about a few things along the way. i loved those moments spent with lala bear. it's been quite a long time since we've been like this with each other because i've been busy with so many things in my life and she's been busy with hers too. sometimes i try to be a part of her life as much as possible because i seem so out of touch lately. we ended up walking around MPH. they had awesome 3 for 2 promotions so my hands got itchy and decided to get some books along the way. i know i'm not supposed to, but i couldn't resist!!! so what's in the bin? i'm a sucker for books of these genre. i've got tonnes from torrey haden, and now this. i think i'm a masochist. LoL. 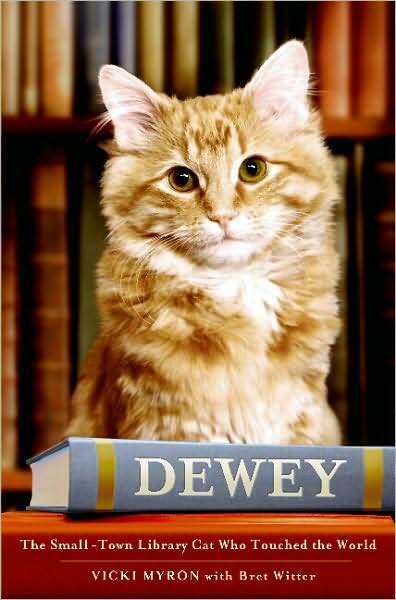 "DEWEY" BY VICKI MYRON WITH BRET WITTER. this cute leetle tiny kitty came over and rubbed itself against my feet when i got back to my apartment today. i swear if i didn't respect my landlord and landlady that much, i would've brought it back with me. it was so super duper cute!! FINALLY!! i got my eighth coelho and i am DEAD excited about it. :P even though i have yet to finish 3 of the 7 that i bought last time, i couldn't miss my chance of getting it. spent most of my tonight talking to a few people and cheering some of them up. most of the time i feel that i don't really make sense but when it comes down to it, i do try hard enough to make people understand. but we need pills to sleep at night. if only we'd choose to be. privacy is meant to be kept so there isn't going to be any names; but to those who are reading this - that's just the one thing i would would never say to you. I'm done the song. AND I WAS PLANNING TO BUY YOU BRIDA LER!! !